Performers include: Donald Glover, Brian Tyree Henry, Lakeith Lee Stanfield, and Zazie Beetz. 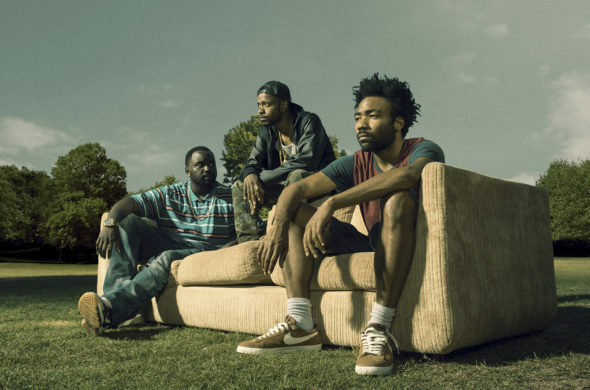 Starring and created by Donald Glover, this comedic TV series follows two cousins who work through the Atlanta, Georgia music scene as they try to better their lives and the lives of their families. Earnest “Earn” Marks (Glover) is a young manager who’s trying to get his cousin Alfred’s career off the ground. Alfred Marks (Brian Tyree Henry) is a new hot rapper trying to understand the line between real life and street life. Other characters include Darius (Lakeith Lee Stanfield), Alfred’s right-hand man and visionary; and “Van” or Vanessa (Zazie Beetz), Earn’s best friend and the mother of his daughter. What do you think? Do you like the Atlanta TV show? Do you think it should be cancelled or renewed for another season? I got a little bit late to the party, but I do love this show. At first I just watched a couple of episodes over a couple of days and then I ended up binge watching the rest of season 1 and all of season 2 in a 24 hr period. Please don’t cancel this show. I have really enjoyed it and been scanning the net since I finished it to find out when it will be back so I can continue with it. This show is SO AMAZING!!! IT SHOULD NOT BE CANCELLED AND I HOPE AND PRAY THERE IS ANOTHER SEASON COMING SOON. This show should be cancelled. Promotes racial stereotypes. This show simply states things how they currently are in a comical way. You must not understand.